Everything in its right place. That catchphrase from a Radiohead song (and its inevitable ambiguity) seemed to summarize the direction of Thom Yorke’s thoughts as the band’s lead singer sat in a Toronto hotel recounting his recent adventures as band-mate, musician, citizen and father. Encountered after breakfast on a sunny day, during a break in a tour that thus far has been happier than some Radiohead excursions, Yorke at 37 seemed serene and relaxed. The professional strains of past years have lessened, and family life (he has two children) agrees with him. The band has been recording again, despite (or because of) its lack of obligations to any label. He has got a record of his own ready for release next month on XL Recordings, made in a spirit of fun and exploration with Radiohead’s long-time producer, Nigel Godrich. “It was like we’d been let loose in the tool cupboard,” Yorke said of his sessions with Godrich. 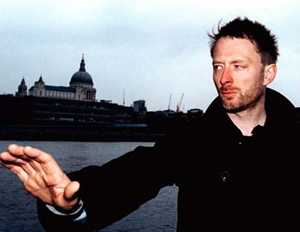 It took just seven weeks to put The Eraser together — a stroll in the park compared with some of Radiohead’s gruelling studio marathons. He often cut and pasted samples at random, not looking at the screen, then combed through the results to see what chance and the rhythm of the process had put down. The tricky thing, he said, wasn’t making the sounds, but recognizing which of them were right. His resistance wasn’t just about the concept. If these pieces were indeed songs, he thought, they were being born the wrong way around. “I was used to having the lyrics written beforehand,” he said. “Writing to sequences and samples is a lot harder. When you listen to them over and over again, you can’t react spontaneously and differently every time. What happens is you listen once, and go away and come back later and do it again, which, practically speaking, takes too long. One song ( The Clock) began at his house, under the influence of an album of Arabian music, full of very quick, repeated guitar riffs. He made something similar, using tiny looped fragments that eventually became the ground for a gliding, droning song about losing control while pretending “that you are still in charge.” But the piece took a manic detour when he tried to finish the lyrics by playing it on guitar. “It sounded like this mad, Johnny Cash skiffle tune,” he said, shaking his head. But another song, the bluesy Black Swan, actually gained from his handmade arrangement, which yielded some guitar bits that he and Godrich liked enough to include in the recorded version. The album inevitably shows its computer origins, at a time when Radiohead’s new music (much of which is showing up on its current tour) seems to be moving back toward a more direct rock aesthetic. The Eraser as a whole is recognizably related to the Radiohead catalogue, especially in its surface beauty and underlying sense of unease. Even when singing a love song ( Skip Divided, for example), Yorke sounds tense and vulnerable, and his lyrics imply that the difference between love and loathing may be small. As always, it’s nearly impossible to separate the personal, the political and the mythological. Harrowdown Hill has parts that sound like a love song (“I’m coming home, so dry your eyes”), but there’s menace in the opening lines (“You will be dispensed with when you become inconvenient”) and other parts sound like a grim political showdown (“there are so many of us that you can’t count”). Yorke had already written part of it when he realized it was about David Kelly, a chemical-weapons inspector in Iraq who committed suicide in 2003 after being connected to a leak of British intelligence about weapons of mass destruction. The body was found in a wood near Yorke’s former school in Oxfordshire. In the public realm, from Yorke’s point of view, everything is definitely not in its right place. He has acted as a spokesman for Friends of the Earth, but when an opportunity came up to meet with British Prime Minister Tony Blair, he decided he was too disgusted with the government’s policies on the environment and on the Iraq war to see any point in doing it. His album title, The Eraser, is a reference to all those acts of determined inattention, about which Yorke has come to feel even more strongly since becoming a father of two. The Radiohead family now includes 11 children, whose demands had much to do with the band’s 18-month dormancy before recordings began. “We made a conscious decision to be good dads,” Yorke said. “We didn’t see each other much at all, and it was really difficult getting back together, because you get sucked back into home life. But you have to work, you’ve got to carry on. Or not. To judge from the rapturous response to Radiohead’s Toronto concert on June 7, the fans seem ready to wait for whatever this most self-directed band decides to do.